IBM® Z has a close and unique relationship to its storage. Over the years, improvements to the Z processors and storage software, the disk storage systems, and their communication architecture consistently reinforced this synergy. This IBM Redpaper™ Redbooks publication summarizes and highlights the various aspects, advanced functions, and technologies that are often pioneered by IBM, and that make the IBM Z® and the IBM DS8880 products an ideal combination. 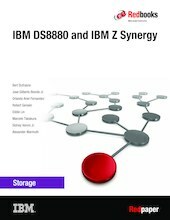 This paper is intended for those users who have some familiarity with IBM Z and the IBM DS8000® series and want a condensed but comprehensive overview of the synergy items up to the IBM z14™ server and the IBM DS8880 Release 8.51 firmware.